Few raids have been subjected to so much scrutiny, analysis and comment as Operation Jubilee, better known as the Dieppe Raid. It aimed to seize a major port and to hold it for a short period, while seeking opportunities to gather intelligence and to demolish important infrastructure and buildings. The raid would show the UK's determination to fight on and, if successful, it would boost the morale of the armed forces and the country. At the same time, Mountbatten wanted to test Combined Operations amphibious landing training, equipment and techniques in a sizeable raid against entrenched German shore defences. The raid failed in almost every regard and at a high cost in lives lost, numbers injured and captured, particularly for the Canadian Forces involved. In August 2012, a 'History TV' documentary based on 15years research by David O'Keefe provided fresh insight into other top secret purposes behind the raid, which casts a different light on the day's events. More details on this below. In any event, lessons were learned and similar mistakes were avoided in future amphibious operations, including D-Day. 1942 was the worst year of the war for the Allies. At the time of Operation Jubilee, the UK could not boast a single victory against the Germans in the field (excluding Commando 'pin-prick' raids) and British and Commonwealth troops in North Africa were being contained and driven back by the Africa Corps. In the Far East, the Japanese were occupying substantial parts of the former British Empire, the Americans were still feeling their material losses at Pearl Harbour and struggling to maintain what was left of their Philippine Army and the Russians were under pressure as Hitler's thrust into the Caucuses took hold. The immediate outlook was bleak. The most critical situation was on the Russian Front, where the German offensive seemed unstoppable. Stalin called loudly and often for an offensive in the west to reduce the pressure on his armies and, in truth, a Russian military collapse would be catastrophic for the whole Allied war effort. The Russian viewpoint enjoyed American support, with some American military leaders favouring action in the Pacific against the Japanese, if no large scale offensive in the west was possible. The general public also agitated for offensive action in support OF the beleaguered Russians. Mass rallies were held in both Trafalgar Square in London and Madison Square gardens in New York during April, 1942, which called for "a second front now!" There was, therefore, increasing pressure on Churchill and the British Chiefs of Staff to mount a significant offensive operation on the Western Front, that would at least discourage Hitler from sending additional reinforcements to the East Front. 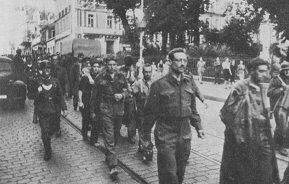 It was against this menacing background that the Dieppe raid was planned. Originally conceived in April 1942 by Combined Operations Headquarters (COHQ), and code named 'Operation Rutter', the Allies planned to conduct a major, division size, raid on a German held port on the French channel coast and to hold it for the duration of at least two tides. They would cause the greatest amount of destruction of enemy facilities and defences before withdrawing. This original plan was approved by the Chiefs of Staff in May 1942. It included dropping paratroops inland of the port, prior to a frontal amphibious assault. However, with the involvement of paratroops, the raid was vulnerable to weather conditions in the area. General Montgomery was to supply the bulk of the troops from his South Eastern Command but the Canadian Government pressed for Canadian troops to see some action. 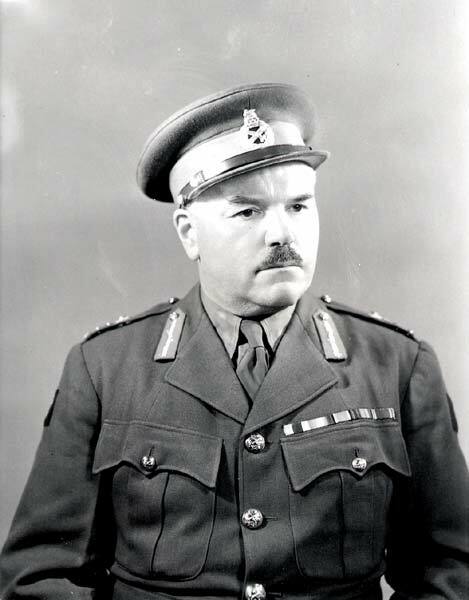 The Canadian 2nd Division, under the command of Major-General 'Ham' Roberts was, subsequently, selected for the main force. The 237 vessels, 5,000 Canadians, 1,000 British and 50 US Rangers assembled in five ports on the south coast of England between Southampton and Newhaven. In support were 74 squadrons of aircraft, of which 60 were fighter squadrons. Early rehearsals were disastrous and, by the time they improved, the consistently bad weather caused delay. Montgomery felt the security of the operation was compromised, since the troops had been briefed and German fighter-bombers had attacked the troopships and the supporting fleet gathered in the Solent, causing damage to two vessels. On July 7th, the raid was postponed and the continued unsettled weather conditions just added to the gloom as the troops and shipping were dispersed. Had Montgomery not been ordered to Egypt to take command of the Eighth Army, the continued representations he never made may have prevailed, as it was, in the weeks ahead, the plan was rejuvenated and renamed 'Jubilee'. Although the original planning had been undertaken by COHQ, an inter-service committee representing Air, Army and Naval forces contrived to make the operation less weather dependant by replacing the paratroops with seaborne troops from No 3 and 4 Army Commandos. They also reduced the scale of the planned air bombardment to minimise the risk of French casualties but, to compensate, provided 8 destroyers to bombard the shore. There would be 27 Churchill tanks in support of the main infantry assault. The final plan, accepted by all 3 services and the Chiefs of Staff, envisaged assault landings at eight separate locations in the vicinity of Dieppe. The Royal Marine Commando were to land in fast motor launches after the main landing to destroy the dock and recover documents thought to be held in a port office. A raid of this size involving over 200 vessels, 6000 troops and 3000 naval personnel would allow the Allies to evaluate the effectiveness of their training, equipment, communications and strategies. This amphibious assault landing on a defended coast would be the first undertaken by the British since Gallipoli 26 years earlier. There had been changes too in the capability of the defenders, so it seemed prudent to reflect on the experience of a raid this size before embarking upon the largest amphibious invasion force in human history, with consequences to match. Although they didn't know it at the time, their intelligence on the enemy forces and the local topography was patchy. The cave-like gun positions in the cliffs on both sides of the main landing beaches were not recognised on Allied air reconnaissance photographs and the suitability of the beaches in terms of gradient, surface and sub surface for heavy tanks was assessed by examining holiday snapshots and postcards. Furthermore, the Germans were aware of Allied interest in Dieppe, because of increased radio chatter, the concentration of landing craft and their own spy networks. Commando forces were to land in pre-dawn darkness; No 3 Commando approximately eight miles east of Dieppe to silence the coastal battery near Berneval, No 4 Commando and 50 US Rangers to neutralize the coastal battery near Varengeville, six miles west of Dieppe. In both cases they would make two landings to effect a pincer movement on the batteries, which each had a cadre of over a hundred. Both of these gun positions could easily range on assault ships positioned off Dieppe, so their neutralisation was important. An assault force (see map for composition) would land at four separate locations, immediately to the east of Dieppe at Puys and immediately west at Pourville, half an hour before the main assault. Their objective was to disable the guns and machine gun nests on the cliffs that covered the main landing beaches east and west of the town. The main assaults on two beaches in front of the town were scheduled for the early daylight hours - essentially a frontal assault. Dieppe was not thought to be heavily defended and with tank support in the front line, it was anticipated that this force would be sufficient to accomplish the raid's objectives. Operation Jubilee commenced in the late evening hours of August 18th, 1942. It was a warm, moonless night as the fleet of vessels headed across the channel. The presence of a German convoy proceeding to Dieppe from Boulogne had been picked up by Radar stations on the English coast. Twice, at 1.30 am and again at 2.30 am on August 19th, they radioed warnings to the naval commander Captain Hughes-Hallet. These warnings were not acknowledged and the raiding force took no evasive action. The main assault troops were convoyed in large mother ships, with their LCPs (Landing Craft Personnel) hanging from davits ready to be lowered into the water a few miles off shore. 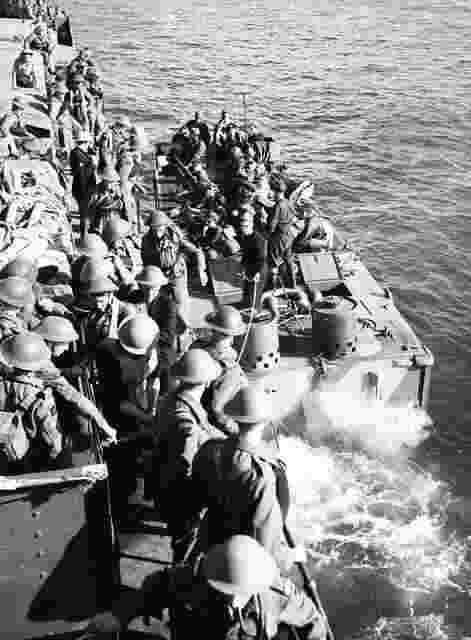 Most of the Commandos travelled independently in their own LCPs which held about 20 men each, while LCTs (Landing Craft Tanks) transported the tanks. No 3 Commando occupied 25 LCPs at the eastern end of the assault convoy. At 3.48 am they ran into armed trawlers escorting a tanker and in the resulting melee, several of the flimsy LCPs were sunk and the rest scattered. Any element of surprise the assault force had expected was now lost and the dispersion of No 3 Commando substantially weakened their capacity to suppress the eastern flank gun battery at Berneval. 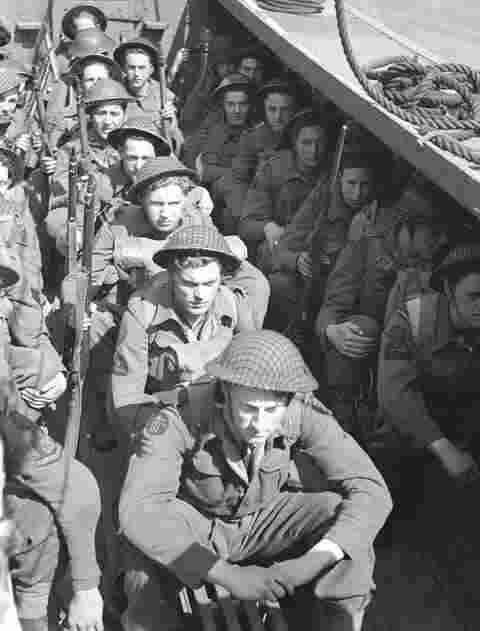 Only 18 Commandos landed on time at their planned landing points, which removed any prospect of an all out attack. They resorted to sniping, which proved quite effective in keeping the German gunners occupied but they were eventually forced to withdraw in the face of superior German forces. The battery was sufficiently restrained that, as far as is known, no vessel was sunk by its gunfire. No 4 Commando executed an almost flawless operation and, in hard fighting, they overran and neutralized the coastal battery on the western flank. Commando Captain Pat Porteous was awarded the Victoria Cross for his part in this hard fought battle. At Puy, the Royal Regiment of Canada suffered grievous losses, when only 60 out of 543 men were recovered from the beach and to the west of Dieppe, only a few men from the South Saskatchewan Regiment reached their objective. The Queen's Own Cameron Highlanders of Canada penetrated the furthest inland but were forced back with the arrival of German reinforcements. 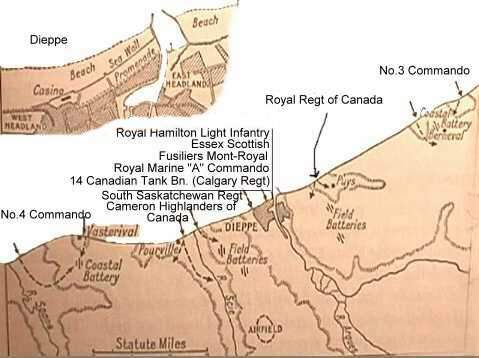 The main assault landings by the Essex Scottish Regiment and the Royal Hamilton Light Infantry immediately encountered fierce opposition from an alerted and prepared enemy. The original heavy air bombing attack had been removed from the plan and a protective smoke screen was blown clear of the beach by a southerly breeze. Nine tanks scheduled to land with the first infantry assault were late due to navigational errors and when tanks did land many lost their tracks, as they bogged down in the deep shingle, leaving them vulnerable to anti-tank fire. 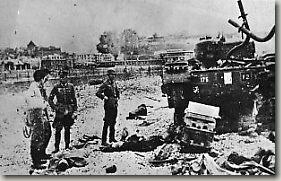 Thirteen tanks left the beach area but were stopped by concrete road blocks and did not reach the town. Intelligence gathering had failed to identify numerous gun and machine gun positions in caves dug into the high cliffs overlooking the landing beaches or that the port was strongly defended by experienced German troops. The supporting bombardment by destroyers and a low level strafing attack by 5 squadrons of Hurricanes did not suppress the German defences. Commander Harry Leslie, RNVR recalled the failure of the support ships to depress their guns sufficiently to hit the German positions at either end of the bay. His flotilla of MLs supported the landing craft and for his part in towing damaged LVPs offshore to safety in very hazardous conditions, he was awarded the DSC. All these factors contributed to the mowing down of the initial assault of infantry and engineers. Without covering fire, the enfilading fire onto the landing beaches was unrestricted. 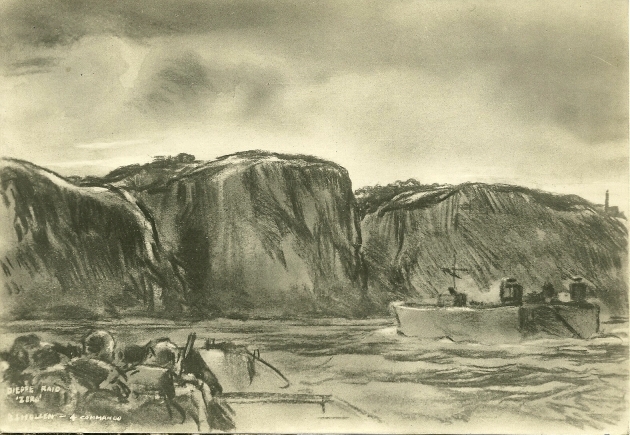 Subsequent assault waves piled into the first and were subjected to similar treatment. A few groups of Canadian infantry broke into the town but only confused and misleading reports reached the force commander, Major-General Roberts, aboard his headquarters ship. It was some time before the commanders afloat realised the disastrous situation on the beaches, unfortunately only after the floating reserve had been sent into the carnage. At 9.40 am, the signal to withdraw " Vanquish 1100 hours" was sent to all the assault forces. The evacuation of the surviving troops added many more casualties amongst the naval officers and ratings manning the landing craft and the troops trying to reach them. Almost 4,000 Canadian and British had been killed, wounded or taken prisoner. The Canadians lost two thirds of their force, with 907 dead or later to die from their wounds. Major-General Roberts unfairly became the official scapegoat and was never to command troops in the field again. Year after year, on August 19th, a small box arrived in the post for him. Its contents, a small piece of stale cake - a cruel reminder of his attempt to boost morale at the pre-raid briefing "Don't worry boys. It will be a piece of cake!" there were few less suited locations on the French coast for an assault landing. 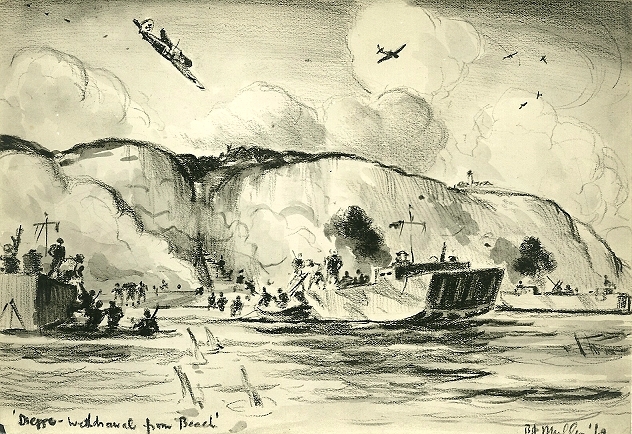 The tall cliffs in the area of the main landing beaches were perfect for enfilade fire on the assault troops and the deep beach shale was absolutely unsuited to heavy vehicles including tanks. the intelligence available was inaccurate incomplete and misleading. The information on the German defences, troop levels and beach conditions was hopelessly out of date. It's been suggested that more up to date information on some aspects was available through ULTRA (the top secret breaking of the German Enigma codes) but was never asked for or passed on. the assault was viable only when certain conditions of time and tide prevailed. These conditions (high tide at or near dawn) were as well known to the German forces as they were to the British planners. It was not surprising, that during these periods of potential threat, German forces would be on heightened alert. Despite this, the plan depended on tactical surprise. Was it an error to believe that the Germans were unaware of these factors? post war post-mortems have often focused on the changes to the original plan in general and the withdrawal of the bombing force in particular. It's arguable that these changes by themselves were not the overwhelming decisive factor. Bombing was not a precision tool at the time of Dieppe, when pin point accuracy was needed to keep German defenders running for cover. It's conceivable therefore that a much heavier weight of offshore bombardment was needed than was provided. If heavier capital ships had been present, they could have kept the defenders heads down until the troops were within a few meters of the beach. the plan was heavily dependent on the critical timing of its various components - there was little or no room for error or delay anywhere without adverse knock-on consequences. The effect of this weakness was compounded by poor communications, which failed to update senior officers of progress in time to take appropriate remedial action. The capture of a usable port early in any large scale invasion of enemy occupied territory was ideal for the immense logistics involved in keeping the supply chain open. However, such an objective was fraught with difficulties, hence the long held emphasis on landing directly on to unimproved landing beaches. The experience of Dieppe reinforced the wisdom of this view and it became the inspiration behind the development of Mulberry Harbours and the Pipe Line Under the Ocean (PLUTO) and many other special initiatives that contributed to the success of subsequent major landings in North Africa, Sicily, Italy, Normandy, Southern France and Walcheren. The need for reliable intelligence on the strength and disposition of the defending forces and the topography on and around the landing beaches was clearly paramount. Lt Commander Nigel Clogstoun-Willmott, RN, who had undertaken beach reconnaissance trials in the Mediterranean, was recalled to the UK in the summer of 1942 to set up training programmes for the Combined Operations Pilotage Parties (COPPs). Beach reconnaissance became an integral part of the planning process for the invasion of North Africa in early November 1942 and in all future major landings. 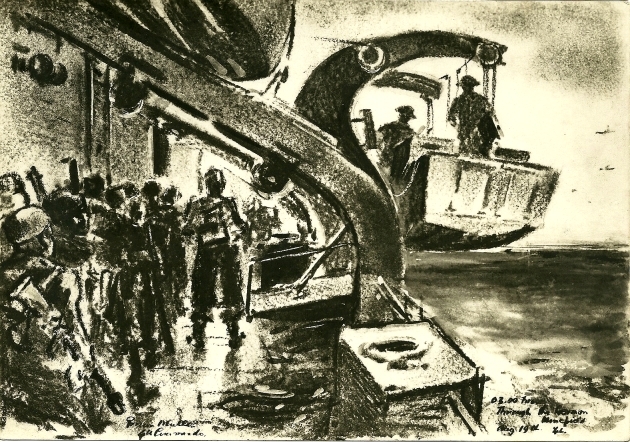 Consideration of the supporting role of vessels at sea produced numerous landing craft adaptations such as: Landing Craft Gun LCG, described by the BBC on D-Day as 'mini battleships', with their 4.7 inch guns and other armaments operating inshore; Landing Craft Flack, LCF, to provide anti-aircraft cover over the landing area; Landing Craft Tank (Rocket), LCT (R), for the initial bombardment of the beaches in advance of troops landing and Landing Craft Assault (Hedgerow), LCA (HR), that could lob volleys of spigot bombs onto the beach area, primarily to detonate hidden enemy mines. The need for troop commanders afloat to be aware of the on-going progress of the invading force was essential for well considered and justifiable decisions on, for example, the commitment of reserves or a timely and well organised strategic withdrawal. 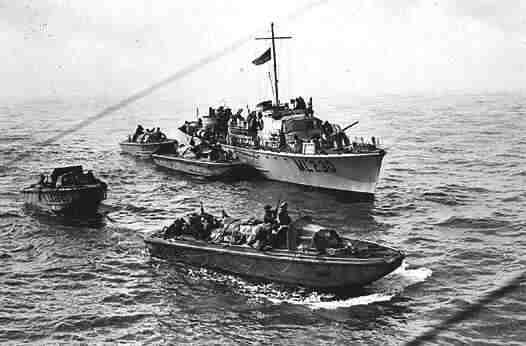 The need for landing craft to be armoured against small arms fire was now considered an imperative to reduce casualties on the approaches to the landing beaches. Who knows how many lives were saved in later amphibious landings, particularly Normandy, as a result of the casualties at Dieppe? This failed assault had ramifications for the German forces too. Their confidence grew in their ability to withstand an invading force and they came to believe that the inevitable Allied invasion would include an area with good port facilities. They subsequently concentrated on providing stronger defences around the main ports to the detriment of open beach locations. In this context, Albert Speer, former Nazi minister of armaments, admitted at the Nuremberg trials that the Germans' costly, two-year effort to construct Atlantic defences had been 'brought to nothing because of an idea of simple genius' - the Mulberry Harbours. 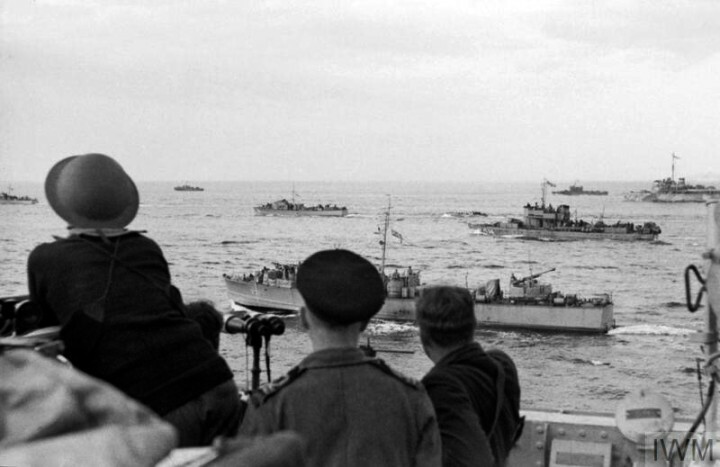 The Dieppe raid carried with it a high cost but the lessons learned inspired and accelerated many initiatives that contributed to the success of subsequent landings. Sketches by B J Mullen of 4 Commando courtesy of Frank Sidebottom. His late father in law, Ben Clifton, served alongside the artist. Left to Right; Zero Hour, Through the German Minefield, Withdraw from Beach, Rescue of US Airman in Channel and Ben Clifton of 4 Commando, Ex York & Lancaster Regiment. Under General John Hamilton ‘Ham’ Roberts' watch, nearly 1,000 men died in just six hours. 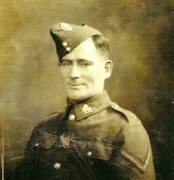 He lived out his days in the Channel Islands and never sought to justify his decisions or otherwise to defend himself. "But there's more to the story as we learn more about that ultra-secret raid" writes historian and author David O’Keefe, "and it suggests that he was made a scapegoat." 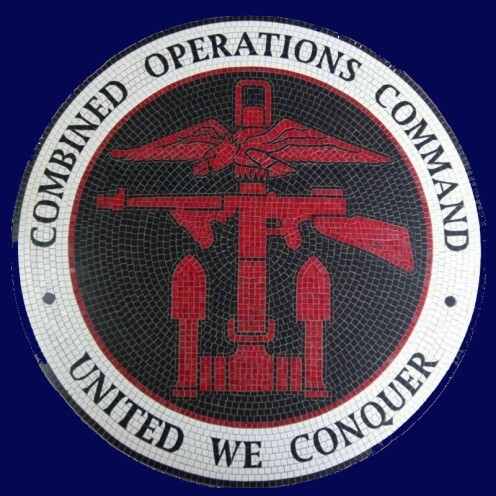 Click on the link below for a well written and plausible new perspective on Operation Jubilee. The outcome would almost certainly have been very different had General Roberts' resources included those the Dieppe experience may have encouraged to be developed, particularly the LCT(R) and the LCG. 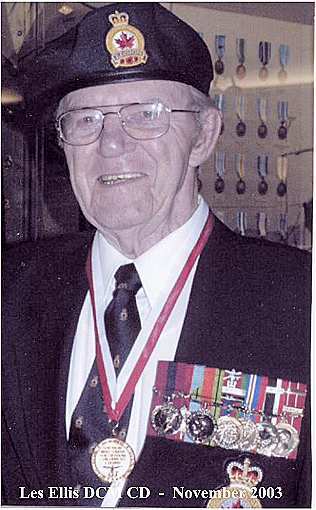 At a ceremony held in November 2003 to award Corporal Leslie Ellis a commemorative Dieppe medallion for his part in the Dieppe raid, he recalled that he landed with the Royals at Puys... "some say it was a dress rehearsal for the invasion (of Normandy) and some say it was a whim of the top echelon. History says the Germans were waiting for us and we didn't have a chance after that. We were all well-trained, we did what we were trained to do. We were proud to have done it, we were soldiers ... we did what we were expected to do." The impact of that major battle may still be debated but what remains certain is that the Canadian soldiers were brave and there was "a feeling of pride" to serve with them. "They were a great bunch of people. I was fortunate that I got over the (beach) wall and got back with a few injuries and the Good Lord spared me. It all happened so fast." He had made it behind enemy lines but as the power of the German ambush became clear Canadian soldiers were forced to retreat. 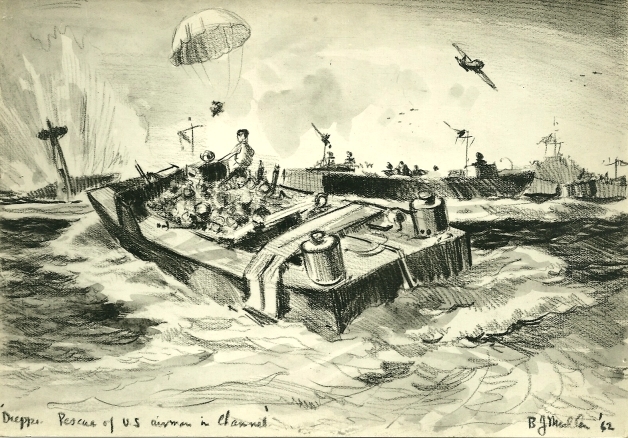 When Ellis ran back to shore, he found the landing craft already weighed down with injured soldiers and he knew that if he stayed at Dieppe he would either die from enemy fire or be taken prisoner of war. So he decided to swim in the hope that he might be rescued. "There was no sense for me to get on that boat, so I took off my clothes and swam. I was heading for England!" A soldier in a row-boat finally found him but he doesn't remember being pulled out of the water. "I woke up in an anti-aircraft naval boat." he recalled. The NCO landed with the first wave at Puys, during the operation in the Dieppe 19 Aug 42. After a gap was blown in the wire on the sea-wall, L/Cpl Ellis passed through the gap and proceeded up the hill to the right; He immobilized booby traps, explored a recently abandoned enemy post, and arriving at the top, engaged an enemy post east of the beach. Finding himself alone, and seeing the second wave coming in, he returned to the wall to guide them forward. Coming across a comrade paralyzed in both legs he dragged him nearly back to the wall. Here the wounded man was killed and L/Cpl Ellis himself wounded. He succeeded in crossing the wall and was evacuated as a casualty. L/Cpl Ellis in this action displayed the greatest initiative, skill and devotion to duty. Canadian Award. The Dieppe Bar is awarded to those who participated in the Dieppe Raid on August 19, 1942, and is worn on the Canadian Volunteer Service Medal ribbon. A silver bar, to be attached to the ribbon of the Canadian Volunteer Service Medal (CVSM), has been designed featuring the word DIEPPE in raised letters on a pebbled background. Above this, the bar bears an anchor surmounted by an eagle and a Thompson sub-machine gun. The design was created in consultation with the Dieppe Veterans and Prisoners of War Association. Considering the loss of life at Dieppe there was little good came of it except lessons learned. However so successful was the raid by No 4 Commando that a training manual based upon their experiences was published for the benefit of future operations. The Commandos at Dieppe: Rehearsal for D Day by Will Fowler. Published by Harper Collins 2000. ISBN 0 00 711125 8. Detailed account of the successful destruction of the Hess Battery by No 4 Commando commanded by Lord Lovat. Dieppe: Tragedy to Triumph, Brigadier General Denis Whitaker and Shelagh Whitaker, 1992, ISBN 0-07-551385-4 (Denis Whitaker was an infantry captain who landed on the main beaches at Dieppe. One of the most authoritative books on the subject). Dieppe, the Shame and the Glory by Terence Robertson published by Pan 1965. 500 pages. 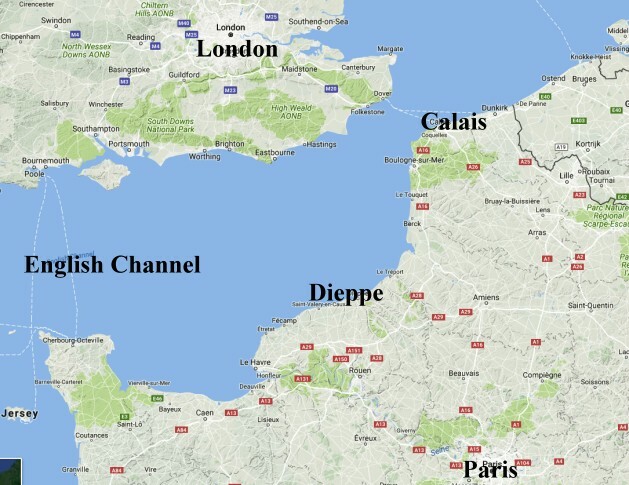 Dieppe Revisited - a Documentary Investigation by John P Campbell. Published by Frank Cass & Co Ltd.,1993. ISBN 0 71 463496 4. Dieppe (through the lens of the German war photographer) by Hugh Henry. Published by Battle of Britain Prints International Ltd. ISBN 0 90 09176 2. Mountbatten and the Dieppe Raid by Brian Loring Villa. Published by Oxford University Press 1994. ISBN 0 19 541061 0. Clash by Night by Derek Mills-Roberts. Published by William Kimber, London 1957. Storm from the Sea by Peter Young. Published by William Kimber, London 1959. Rendezvous at Dieppe by Earnest Langford. Published by Harbour, Madeira Park, BC 1992. Dieppe at Dawn by R W Thomson. Published by Hutchinson, London 1956. The Price of Victory by R W Thomson. Published by Constable, London 1960. Raiders from the Sea by Contre-Amiral Lepotier. Published by William Kimber, London 1954. Dieppe 1942 - The Jubilee Disaster by Ronald Atkin. Published by MacMillan, London 1980. Dress Rehearsal - The Story of Dieppe by Quentin Reynolds. Published by Random House, New York 1942. We Led the Way: Darby's Rangers by William O Darby. Published by Presidio Press 1980. I'm a historian looking for any information about the early days of Combined Operations in 1941-42. 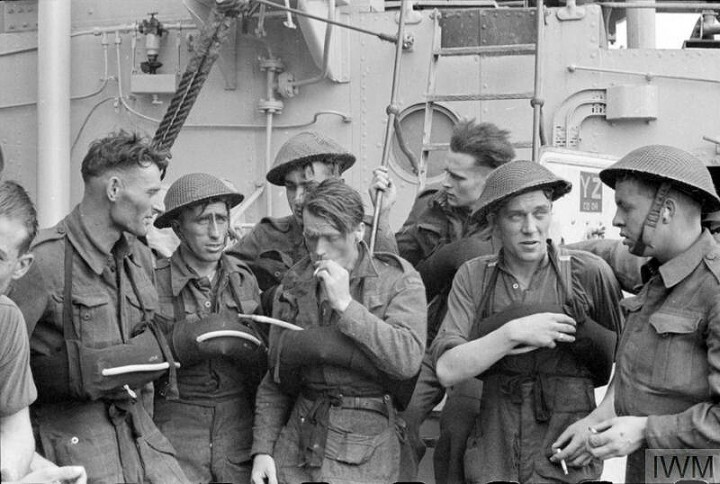 I'm interested in hearing from veterans, their families and friends or anyone with knowledge about the men who crewed landing craft during the Dieppe Raid. I'm also interested in the experiences of sick berth attendants, gunners and Royal Marines involved in the landings on 19 August 1942. If you have any memories, diaries, ship's logs, documents, letters, stories, names, photographs or information about Royal Naval personnel training with Landing Craft generally and those involved in Operation Jubilee in particular, I'd love to hear from you. No information is too little or inconsequential. 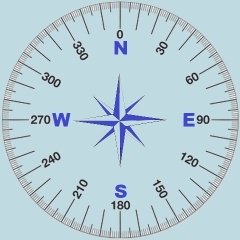 Clíck on the e-mail icon opposite to reply. One of Churchill's greatest concerns during the war was the submarine menace particularly in the Atlantic. It had the potential to bring the UK to its knees, as merchant ships carrying vital war supplies and food were sunk. However, the British ability to decipher the enemy's "enigma" encoded radio transmissions gave the Allies a considerable advantage in the battle of the Atlantic. In early 1942 this advantage was lost when the Germans changed from a 3 "rotor" system in their "Enigma" encoders to a 4 rotor system. Not surprisingly, Allied shipping losses increased dramatically and were fast approaching the tipping point, where they would exceed the capacity to replace them. It was, therefore, an imperative to crack the new encoding machines, since failure to do so could quite possibly lose the war. British Intelligence was desperate to get their hands on any encoding material, particularly those concerning enemy naval traffic. Against this background, the History TV channel documentary "Dieppe Uncovered" (Aug 2012) puts forward the proposal that the Dieppe raid was a "pinch" operation i.e the whole purpose of the operation was to steal or "pinch" the latest code books and machines from the German Naval HQ in Dieppe or German ships in Dieppe harbour. It further maintains that Mountbatten was persuaded by Ian Fleming (James Bond author) who, at that time, was directly under the Chief of British Naval Intelligence. On Fleming's suggestion, a small "Commando" unit, AU 30 (assault unit 30), comprising a few select Commandos dedicated to looting any secret material found on raids, was formed in April 1942. A surviving member of this unit recalled that their orders were to attack the German Naval HQ in Dieppe and, in his words, to "kill Germans". The lieutenant in charge on the day had the street address of the German Naval HQ with orders to remove any secret material and to deliver it to Commander Ian Fleming, who would be waiting offshore during the raid. AU30 was temporarily attached to the Royal Marine Commandos on board "The Locust" as they attempted to enter the harbour. However, they were driven off by heavy defensive fire, so transferred to small boats for a second attempt to land on a nearby beach. Once again they were beaten back. Of the outcome of this raid there is no doubt, but the big question the documentary raises is whether or not Operation Jubilee was a cover for the "pinch" operation described above or was it just an adjunct to the raid? The documentary's explanation of the attack plan on the town and harbour can certainly be viewed as being in support of the "pinch" while other more conventional reasons were simply promulgated to disguise this fact and to deceive the enemy. The possibility that the Canadian sacrifices had a nobler justification than the "whim" of senior commanding officers may provide some small comfort for the veterans and their families. Operation Jubilee, the raid on Dieppe was substantially based on the work of George H Pitt of Canada with the addition of photographs and comme nt by Geoff Slee.